The Electronic Adjustable Measuring Parallels (EAMP) are manufactured by Equipment Development Services in Schenectady, New York, USA. They are used to measure gaps or openings that are deep and therefore are beyond the range of calipers and telescoping gauges. They can also be used where it is physically impossible to use other measuring methods due to space limitations. 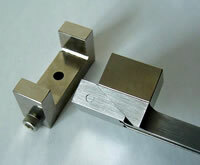 The measuring method is similar to conventional standard machinist sliding parallels. The standard parallels are used by inserting them into a gap and then sliding the two halves until they wedge into the opening. Then you withdraw the parallels being careful not to move them and measure across them using a micrometer. To use the EAMP, you insert the head end into the gap, pull back on the thumb projection, which opens the parallels to their maximum fit in the gap and then read the meter. Add the meter reading to the base dimension of the head and that is the width of the gap. When you push forward on the thumb projection, you close the parallels and get a minimum reading on the meter. By pulling back on the thumb projection, you open the parallels and the meter reads the amount of movement measured in mils and tenth of mils from the nominal dimension, which in the case shown with no adder blocks would be 0.4000 inch or 400 mils. The meter shows that the parallels are open 0.4000 inch plus 0.1328 inches for a total of 0.5328 inches. 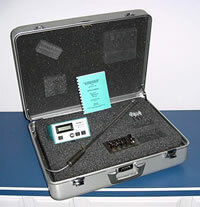 Each set of measuring parallels comes with a set of adder blocks and a 1.0000-inch test gauge. The adder blocks are engraved from #1 to #8 corresponding to 0.1000 to 0.8000 inch long. If you attach the #8 adder block to the head, you can make measurements in the range of 1.1750 to 1.325 inches (0.4000 plus 0.8000 equals 1.2000 nominal). 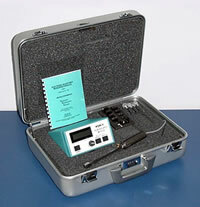 You can check on the calibration of the tool by using the gauge block supplied. Attach the #5 adder block as shown and then insert it into the gauge block. Pull back on the thumb projection to open the sliding parallels and read the meter. In this case, the meter should read 0.1000, which means that the parallels are measuring a gap of 0.5000 inch plus the 0.5000 adder block equals 1.0000 inches. If you want the meter to read exactly 1.0000, you can either use the “zero” knob on the Power Supply Module or loosen the screws that lock the wand into the handle and rotate the handle slightly to achieve 1.0000 and then tighten the screws to lock the wand into position. The Electronic Adjustable Measuring Parallels are manufactured in three wand lengths, 5 inch, 12 inch and 17 inch. Each EAMP is supplied with 4 tools. 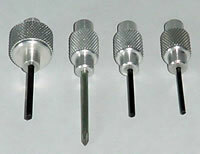 The large knob hex driver is used to tighten and loosen the screws on the handle. One hex driver is used on the 15-pin plug shell security screws to prevent the plug from accidentally disengaging. The other hex driver is used to install the adder blocks and the Phillips screwdriver is used to open the Power Supply Module so that the batteries can be changed. 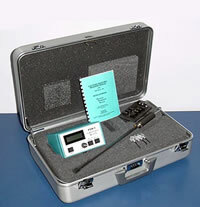 Also refer to the Informational Brochure for the Electronic Adjustable Measurement Parallels.